Although I love online shopping a lot more, in-store shopping is unavoidable, and in order to succeed, we need a good plan when preparing to shop. Have in mind what you're looking for, where to look for it, and how much you're willing to spend. Taking all of these into account before heading to the mall is key for avoiding any unnecessary -and unplanned- shopping. DRESS FOR THE JOB. First of all, dress comfortably. You'll probably have to walk through tons of stores and aisles before finding the right piece, so being comfortable is key. I recommend loose pants (having to take jeans on and off can be tiring), comfortable shoes since shopping involves some good legwork, and layering with a tank top so you don't have to go to the dressing room to try on sweaters or blouses. TRY ON. Unfortunately, this is the only way you'll know if a piece fits and flatters. I avoid going to the dressing room as much as possible, but sometimes it's necessary. However, I do make sure I only go there once. I bring two or three sizes of each piece, I sit, stand, and even jump to make sure the piece doesn't rise too much or feels too tight, and walk around the dressing room aisle to get a better idea of how the garment moves and to see it from a different perspective and different mirrors (some mirrors are a bit unrealistic). LOOK FOR SALES. Almost every store has a sales section all year long. It's smart to go straight to that section before looking at anything else. Also, there are specific times of the year when stores offer great sales on everything. Plan ahead! 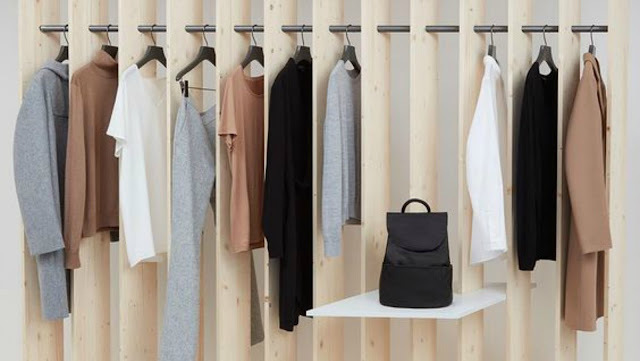 Getting back to the minimalist closet goal, focusing on timeless pieces guarantees you'll find what you're looking for at a lowered price. If you're always buying the latest trends, prices will always be higher. *Remember the 70-30 rule! DON'T REMOVE THE TAG JUST YET. I don't know if this happens to any of you, but sometimes I buy something, and when I get home I don't like it as much. That's why I've learnt to NEVER remove the tag unless I'm ready to wear it and am sure I'll wear it tons of times in tons of different combinations. Impulse shopping is a thing, and it happens to the best, so unless you're 100% sure, don't remove the tag and keep the receipt at hand in case you change your mind. PRINT YOUR COUPONS. Sites like coupons.com and retailmenot.com offer tons of coupons all year long from hundreds of stores. Before heading to the mall, print some coupons from the stores you'll be sure to visit, but use them ONLY on purchases you really need. Any other good tips? Comment below!